Branding and Packaging go hand in hand. For companies looking to catapult their products to the brand status and get noticed amid the rising cacophony of brands, right packaging can help in hitting the bull’s eye in the least possible time. The acceptance of aluminium packaging has grown over the years ; the reasons are many, but before we run a check on them let’s find out what packaging does to a brand, or rather, what is expected of a packaging solution for making it an integral part of a company’s branding strategy. Going by the basics of Marketing, ‘the package is the buyer’s first encounter with the product.’ A well designed package not only influences buying decision but also affects the buyer’s later product experiences. In other words, good packages serve as ‘five-minute commercials’ for the products and help make buyers’ navigation through the aisles of a well-stocked retails store interesting. Present enough innovation opportunities for the brands to build on them. Aluminium Packaging scores high against all these parameters by virtue of being a metal of multiple benefits. Aluminium has a high barrier property. So, packaging made of aluminium provides perfect protection against light, oxygen, moisture, odour, and bacteria, thereby increasing shelf-life of the products by many years. It is also non-toxic and rust-resistant, and does not react chemically with most organic products. So, foods wrapped in it remain fresh and retain all their aromas and flavours for long. Aluminium packaging units are designed in such a way that they can be held easily and opened without putting in too much pulling effort. Aluminium beverage cans, for example, are extremely lightweight and can be opened by simply pulling the easy-to-tear tab openers fixed onto each can. Unlike tinplate seals and closures (the closest competitor of aluminium), the tabs do not cause any cut on the consumer’s body parts as the edges are not too sharp and razor like. Whether it is flexible packaging (foils), semi-rigid packaging or rigid containers, aluminium facilitates hassle-free unpacking of consumables while ensuring zero spillage in sealed condition. The density of aluminium is one third that of steel, 2,700 kg/m3. The low density of aluminium accounts for it being lightweight but this property does not affect its strength. Aluminium foilsare nothing more than aluminium alloy sheets that are between 0.004 and 0.24 mm thick but theyhave tensile strengths of between 70 and 700 MPa! Aluminium rigid containers too are reasonably sturdy and can withstand moderate to high pressure without giving in. This is the reason why panels made of aluminium alloys having greater strength are used nowadays in large volumes to make car and truck exteriors and covers ofa wide rangeof handheld electronic devices; aluminium alloys makes the end products strong and scratch resistant while keeping their weights at a minimal level. The lesser the weight of a stock keeping unit (SKU) the easier it is to transport. Aluminium packaging units, big or small, can be manufactured in large batches, stocked at the warehouses and transported in bulk quantities without worrying about breakage, spillage, or waste of products. The sealed packs can also be stored for the stipulated period of time without any value being eroded. Aluminium is the second most malleable metal in the world, and when alloyed with other metals it becomes all the more formable. 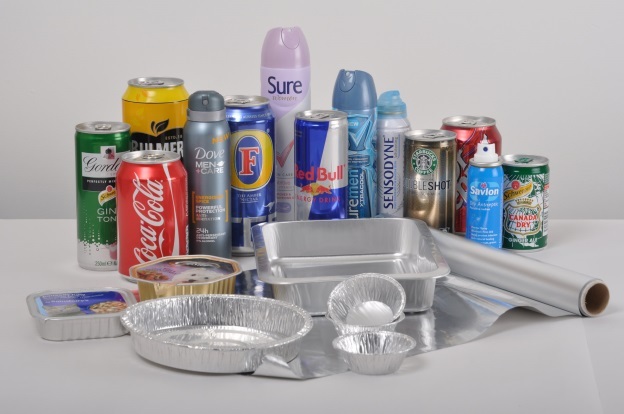 Due to such high formability, aluminium alloy sheets can be used to craft beverage or aerosol cans of novel, dynamic shapes and sizes. With concave bottoms, rounded edges, and bold rims the aluminium beverage cans and aerosol cans bring out the essence of the brands they represent in the best possible way. Aluminium foil too has an appeal of its own. Its suave, silvery glitter makes any wrap look classy and reliable for food packaging. Aluminium sheets, especially aluminium alloy sheets, provide a versatile surface on which to print graphics and text. They require minimal surface treatment before printing. The appearance and surface quality of rolled aluminium alloy sheets is perfectly satisfactory for a wide range of applications. Surface treatment, if done, is mainly to provide corrosion protection. Most modern printing techniques including embossing can be done / applied on the bright or matt surface of aluminium. This presents enormous scope for the designers to create stylized illustrations enhancing packs with special impact. For most aluminium packaging products, the metal is not actually consumed during the product’s lifetime, but simply used. Post consumption of the packaged item, the metal can be recycled without any loss of its inherent properties. Therefore, the life cycle of an aluminium packaging product is not the traditional “cradle-to-grave” sequence, but rather a renewable “cradle-to-cradle”. The aluminium drinks can is the most recycled beverage container in the world. 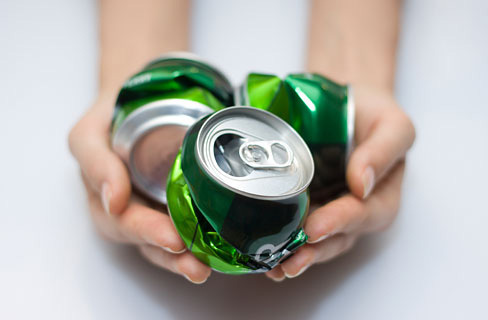 In North America and in Europe, a beverage can is produced, filled, distributed, consumed, collected and recycled back into a can within 60 days! Aluminium foils, too, are recycled to yield secondary metal of substantial economic value. This property of aluminium is valued by brand owners and consumers alike. By investing in green packaging, companies want to establish the fact they care for the environment. They also devise novel recycling programmes from time to time as part of their value-chain based CSR activities. Consumers, on the other hand, opt for products packaged in materials that can be either recycled or upcycled to create DIY crafts. Environment-conscious global citizens are averse to the idea of consuming products that after use end up in landfills. With the need for energy conservation growing stronger, recyclability of aluminium will gain more significance across the world. Rapidly changing demographics and faster lifestyles are altering the consumer behaviour in a more pronounced way than ever. These trends are changing their eating patterns, influencing new product development and, inevitably, the design of consumer packaging. People today place far more importance on factors like ease of handling and consumption, safety over inexpensiveness, subtle aesthetic appeal over on-your-face promotion, and environmental sustainability than did the older generations while making a product choice at various points of purchase (POP) like malls and supermarkets. It has been observed that they tend to grow more loyal to those brands which pay heed to all these preferences through their product development endeavours. Likewise, brand owners too, do not hesitate to walk that extra mile to etch a superior image in their target audiences’ minds by incorporating all these factors in their product packaging blueprint. And what can be a better choice of medium than aluminium to do that? Aluminium and aluminium based materials serve as a complete package for brand owners looking to cut through clutter through innovative packaging. They beat their closest competitors like glass, tinplate and plastics in many areas, and in TETRA PAK, they form a part of it [paperboard (73%), plastic (22%) and aluminium foil (5%)]. Liquid packaging cartons too come in two forms- LDPE coated and aluminium coated. So, the presence of aluminium in packaging is almost a given today. With time this market share will increase further. Aluminium foils and aluminium beverage cans are already the biggest end user segments in the Americas and Europe. It’s so big in the U.S. that can manufacturers are finding it difficult to meet the growing demand from various sectors. The microbrewers in the craft beer industry there, for instance, are worrying about a possible aluminium can shortage that could lead to an aluminium war! The scenario is not yet that overwhelming in the emerging nations like India; but they are slowly catching up. With growing GDP rate, increasing urbanization, and changing lifestyle, packaging will soon become one of prime end user markets for aluminium in these regions overtaking construction and electrical- the current demand drivers for aluminium end use.